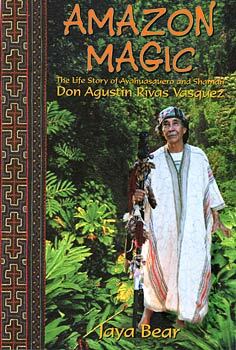 Amazon Magic tells the life story of Don Agustin Rivas Vasquez, an ayahuasquero, a shaman skilled in the use of ayahuasca, a visionary and healing plant medicine. Told in his own workds, Amazon Magic describes incidents from his childhood in a small jungle town beside the Amazon River, and his early and present day experiences with the plant medicine ayahuasca. The book recounts his days of being lost in the remote depths of the jungle which resulted in his living a year with an Indian tribe; his adventures with river dolphins, jaguars and boas; his practical business enterprises; and his becoming a well-known sculptor. It also describes the training and discipline that he underwent to become the shaman and healer that he is today, and explores his use and knowledge of plant medicines, and his current healing work. More importantly, it gives his spiritual and visionary encounters with plant, water, and jungle spirits. The book provides a fascinating look into the cultural life of the Peruvian Amazon as seen through the eyes of someone who is an integral part of this life, and provides a rare insight into the forces that helped shape the life of a profound healer who is now highly regarded in many parts of the world. "This beautiful narrative is full of mystery, smells, sounds, and a reality far from the center of our experience. In this book Jaya has skillfully woven an intimate and authentic biography with nature, magic and history." -- Winona LaDuke, internationally acclaimed activist, vice-presidential candidate on the Green Party ticket in the 1996 election, and author of Last Standing Woman. "By preserving the distinctive flavor and folkstyle of Don Agustin's unabashed narratives, Jaya Bear has created an ethnographic document that reveals an insider's view of the fantastic world of Amazonian shamanism." -- Timothy White, editor of Shaman's Drum magazine. "A fascinating and motivating biography! Jaya Bear portrays the spirit world of nature, through the warmth and knowledge of Don Rivas, close to a reality we can all understand." Jaya Bear is the founder and director of Puma Shamanic Journeys, which facilitates journeys and workshops that create opportunities for deep transformative work and life changing experiences.